A white paper link compilation is now available and titled Online Research Tools by Marcus P. Zillman, M.S., A.M.H.A. . It is a comprehensive listing of online research tools that offer various downloadable as well as web applications to allow you to do your research and searching on the Internet far more effective and productive. It is a freely available 116 page .pdf document (2.39MB) that can be downloaded from the above URL. Other white papers and resources on information retrieval, information extraction and deep web research by Marcus P. Zillman, M.S., A.M.H.A. are available by clicking here. 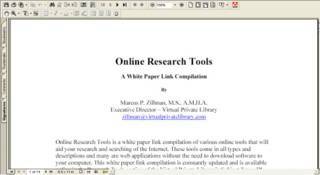 Online Research Tools White Paper Link Compilation was updated June 3, 2009.